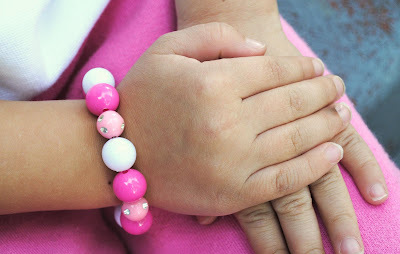 Kids' bracelets, you've seen them at the popular kid clothing stores selling for $5 - $15. 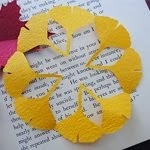 But did you know that they're easy and inexpensive to make? 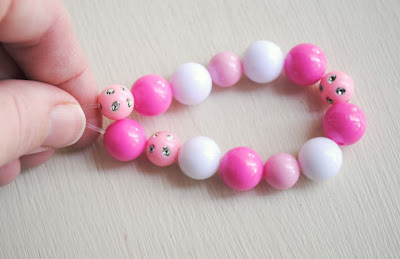 So, today I'm sharing how I make stretchy bracelets. 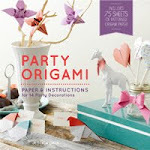 The bracelets are perfect for party favors or gifts. 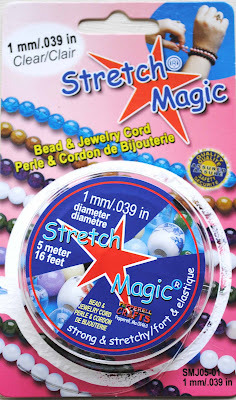 Clear stretch cord (1mm diameter) - I purchased the one above at my local bead shop. You can also find it at the craft store. It doesn't matter what brand you purchase. The most important thing is buying a thick cord ( 1mm diameter ) which will hold up well for kids. Beads - any kind you like. Cut about a 10 inch piece of stretch cord. 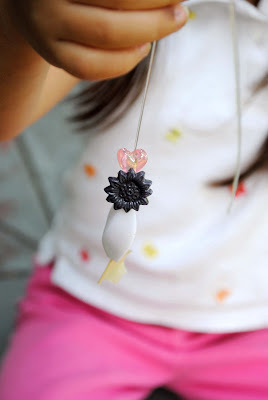 Fold a piece of masking tape on the bottom of the string to keep the beads from falling off. I find this is easier and works better than tying a knot. String on beads. Once all the beads are strung, wrap around wrist to see how it will fit. Adjust beads accordingly. Take off masking tape. Holding both ends together, tie two overhand knots. Add a little glue on the top of the knots. If possible, stuff the knots inside one the beads. Done. This project entertained my kids for a good hour. Most of the fun came from searching and picking out the beads. Even my son was into it. He made one for himself, one for his Grandma and one for his Teacher. Cute! I love the beads you used! Makes me want to go make some bracelets! I have the exact same stretch cord. And I think it's a great idea to use masking tape, as I am always struggling with knots. Hello! Congrats you won my sponsor giveaway! Please email me your shipping address soon! I think my daughter can also understand this simple tutorial. This is really a very nice bracelet... and the colors are so sweet... like pink candies. That first picture is absolutely gorgeous!! 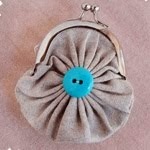 I think Squirrel and I need to make some of these as soon as I can get to the craft store for supplies! Super cute idea! I just picked up some of this cord to see if I could fix some broken bracelets. I might have to go pick out some extra beads though.